Over the years I have discovered the art of living life awake instead of letting it slide by. When you are little your parents take the brunt of the workload required as you learn to live life better. Do’s and don’ts, lectures and lengthy conversations. They teach you how to learn from mistakes and how to improve your strategy. But when you’re older and on your own you are left to your own devices and it is dreadfully easy to just let life live you, when, instead, you could be learning and growing and improving on each little thing you know as you make your way to a more enjoyable life. Living awake to your opportunities, challenges, goals, strategies, shortcomings, joys, loves and. passions leaves you with much more satisfaction then the daily drag, the moaning and groaning, and the whole hard of just living. It is hard, but it is possible to enjoy it more and learn more when you give attention to little details and intentionally live your best. Somehow the need to be intentional with my little guy has kind of jumped on me all at once. In the tired blur of young motherhood and then the exhausted state of early pregnancy, I have been realizing, but not specifically acting on the realization, the fact that as he gets older he needs specific training, teaching, loving, cuddling, interacting (ummm, yeah..so he’s extraverted), running, wrestling and whole list of other activities besides his main needs of food, sleep, cleaning and protection like when he was younger. Even though he is my main responsibility and I love him tons somehow I’ve been remiss in responsibility to focus on him at times. A lot of my problem is that I’m constantly “busy”. Even though I’m actually not. I’m always doing something: reading, writing, shopping, cleaning, running, washing, resting, wasting way too much time on the internet. I always have a plan for my time. I just need to revamp my plans, prioritize my munchkin over the rest of my activities, and get it all together as we learn this trick of obedience. So I may get less done, but the things I am doing will be of more significance and have better outcomes when they get more of my attention. And my kiddo will be happier I’m sure. It will be difficult to focus at first. 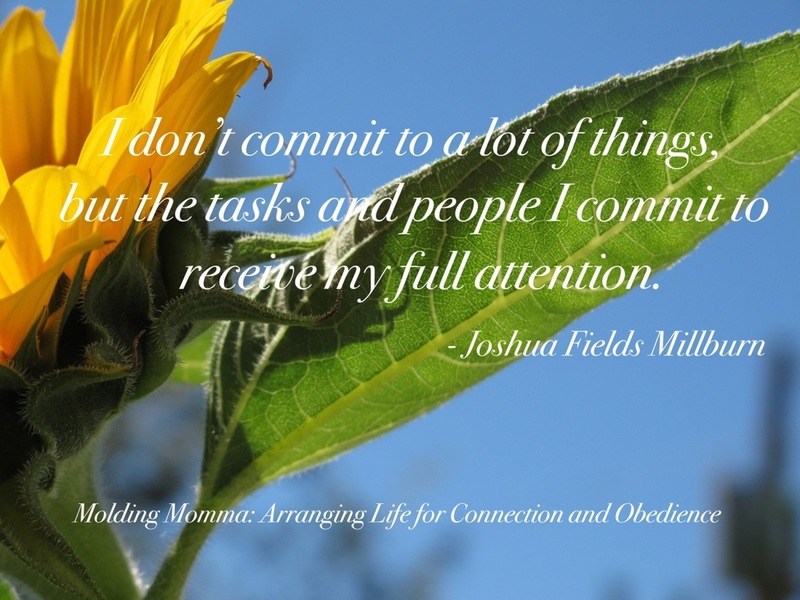 I’m an accomplisher by nature, but I also tend to waste time on minor focuses. I think if I learn some new ways to be intentional with my time with him and my other endeavors, he and I will both be better for it and come out of the arena accomplishing our best work. In reality, his well-being is the most important of all my goals. I just need to reorder my days to better reflect that. It is necessary in my process of becoming an intentional and thoughtful mother. Somehow I think that writing about this process will be the easiest part of this endeavor. Not because I dislike giving attention to my boy, but because of the heart, habit and attitude adjustment on my own part that needs to come along with. Those things will take the most character training for this momma. How do you prioritize your day? What motivates you to use your time well? < Previous 1: buckling down to parenting intentionally. I usually prioritize on the fly. I work through my day, but rarely sit down and make a list of what I need to do. I have nothing to motivate me to use my time well right now. I need to figure it out though, I will be reading your blog closely this month. Yay! Hopefully you will find some motivation here. Mine comes and goes, but being intentional is definitely helpful!